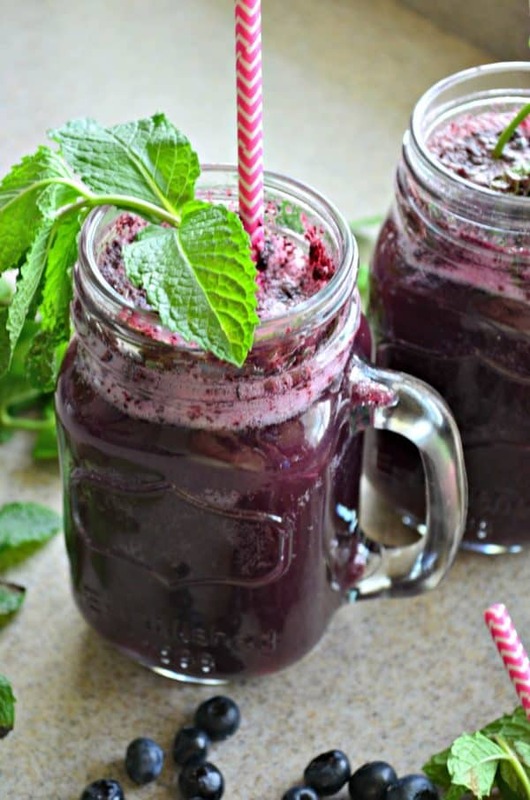 Embrace the fresh fruit of summer and make my fresh Blueberry Mojito recipe. Perfect for entertaining or relaxing poolside with friends and family! Yay for almost a long weekend! 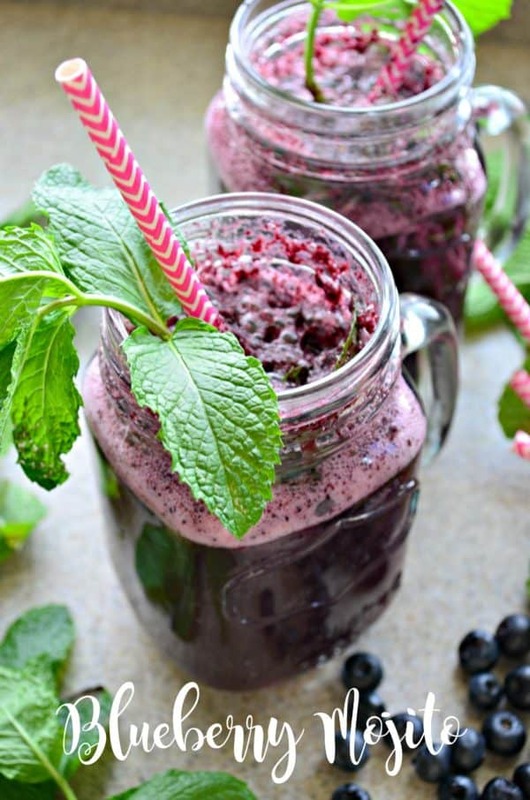 What better way to celebrate than with a blueberry mojito! It’s been a while since I’ve posted a drink recipe, and I’m so excited to share my recipe for blueberry mojitos. My husband loves mojitos. Affectionately dubbed “Mr. Mojito Man” from many friends and family members. I’ve shared our favorite peach mojitos and strawberry mojitos during the past few summers and now I’ve done it again but this time with blueberries! My son, Ryder, and I went blueberry picking last month, and we picked almost 4lbs of blueberries! When my friends asked what I was planning to make the first thing I said was Blueberry mojito! Everyone thought that was a genius idea. Jon loved the mojitos and I actually liked it too. I’m not a huge fan of mojitos but the intense fresh flavors of blueberries made me all for this new drink recipe. I first made a batch of my mint simple syrup. Then, once it cooled I pureed the fresh blueberries, simple syrup, and rum until the berries were smooth. Now, if you don’t like the texture of the blended berries you can strain the the berries through a mesh strainer into another container. Before you pour the puree into the glasses you’ll want to muddle a few mint leaves plus add ice. Then, pour divide the blueberry rum puree among each glass and then top each glass with club soda. Garnish with a little mint leaves and voila you have yourself a blueberry mojito! 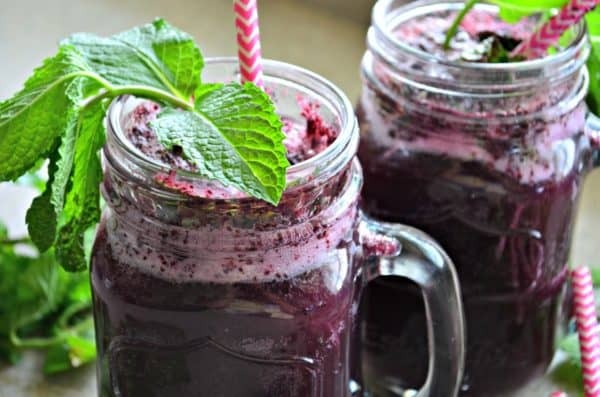 If your entertaining this weekend and looking for a fresh drink to enjoy poolside this summer my recipe for a fresh blueberry mojito is the recipe for you! In each individual glass, muddle 4 mint leaves. Add ice and set to the side. Blend blueberries, simple syrup, and rum until berries are smooth. Divide and pour evenly among 4 glasses. Top each glass with club soda. Garnish with additional mint leaves. Lol…. yes you could always make it one HUGE serving!